When one envisions fasting, many negative connotations may arise. The idea of abstaining from your favorite foods may seem strange to some, especially when you consider the fact that we as human beings require certain amount of food to function properly. This alternate day fasting, as one of the intermittent fasting methods, has becoming popular amongst some. This method of fasting is thought to be beneficial to one’s overall health, as well as being beneficial in weight loss. “Every other day fasting”, as this method of fasting is also known, is exactly as the name suggests, one would fast for one day and then eat whatever they so please the next, and continue this 48-hour rhythm. The main reason individuals do this is to lose weight, and this method of weight loss has been deemed as effective as calorie restriction without negative physical and emotional effects. That being said, calorie restriction does have a plateau of health benefits, including lowering cholesterol and blood sugar levels, and reducing the risk of degenerative diseases occurring. You only have to watch what you eat and measure your calories on days in which you are fasting. The method has been proven to be effective and safe in various human trials. It will help to lower levels of triglycerides, cholesterol, and blood pressure. You will likely to burn more fat whilst intermittent fasting than if you were to maintain a daily diet. It helps to cleanse the body and rid toxins out of it. Reducing your calorie intake on fast days to way below the recommended daily amount (500 or less) can cause depleted energy levels on days in which you fast. When first starting the fasting process, one may experience headaches and/or difficulty sleeping from the first week, or longer. Fasting can interfere with your social and family life, it may be tough to abstain from food in certain situations, or when cooking for your family. 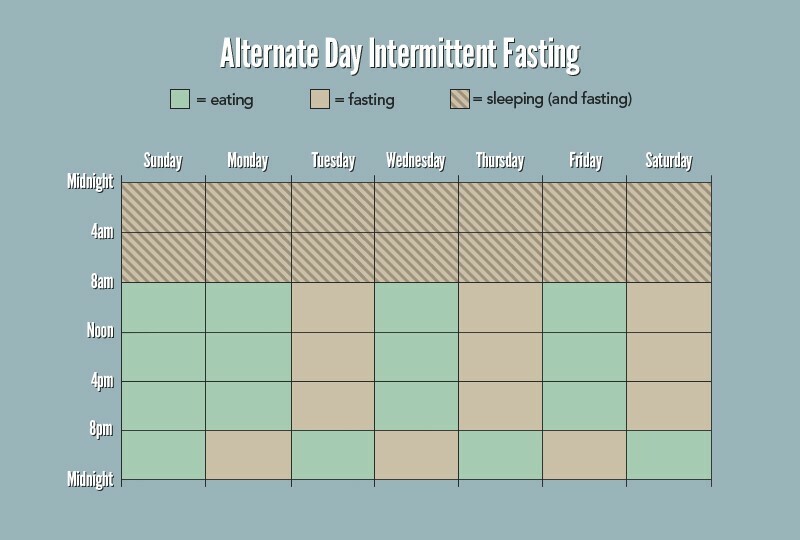 How Does Alternate Day Fasting Work? The body acts differently when one is fasting. When feasting and consuming a meal, the body digests the food and gets energy from it. As this energy is readily available, one’s body will utilize and burn the recently consumed energy first, as opposed to obtaining energy from stored body fat. This is especially true when eating sugar/carbohydrates, as the body burns sugar as energy first before accessing other sources. When fasting, the body has less easily accessible energy due to the lack of food consumed, thus fat stored within the body is more likely to be utilized and burnt for energy, as opposed to the glycogen in your liver/muscles, or glucose in one’s blood stream. Can You Lose Weight Through Fasting? Yes, alternate day fasting or any other type of fasting will cause you to lose weight. That being said, it may not be the safest or most practical method of weight loss. You would lose weight as the body uses stored fat to attain energy required to remain operational during a fast. That being said, when you consume less food, your metabolism naturally becomes slower, to help with energy conservation. Therefore, when return to normal eating habits, the slowed metabolism may cause you to store more energy. This means that you will likely put the weight that you lost back on, or even gain more weight, when consuming the same amount of calories you did before the fast. Fasting also causes adjustment in appetite, meaning that when you fast, you will begin to feel less and less hungry. When you discontinue the fast, the appetite hormones within your body will usually return to normal, leading to an increased likelihood of binge eating. Watch this video to see Dr. Varady’s interview on weight loss & fasting. (Dr. Krista Varady is an expert on alternate day fasting at the University of Illinois, Chicago, and co-writer of the book The Every Other Day Diet, along with Bill Gottlieb). How to Follow the Alternate Day Fasting Diet? On the first day of fasting, one should consume 1/5 of their normal calorie intake through replacement products and supplements. The general guideline for daily calorie intake is 2000 calories for women, and 2500 for men. This means that women should eat around 400 calories, and men around 500 on the first day. And the more you weigh, the more calories you need to ensure a steady weight. After fasting alternatively for two weeks, one should consume food only instead of meal replacements on their fasting days. The daily calorie intake can be increased to 25-35% of your usually daily calorie intake if 1/5 of the recommended amount is too restrictive to follow. Based on the same guideline of 2000 calories for women and 2500 for men, this means that women can consume around 500-700 calories on fast days, and men can consume 625-875. The graphic below depicts a plan wherein you would eat a meal Monday evening, and then not consume food again until Tuesday evening. On Wednesday, you are able to eat throughout the whole day, and then begin fasting until the evening of the following day (Thursday), when you would consume your next meal. This cycle ensures that enough periods of fasting take place and also allows you to consume at least one meal every day of the week. You do not have to remain on this diet indefinitely, the amount of weight you wish to lose determines how long you should fast for. If, for example, you wanted to lose 50 pounds of weight, then you should do around six months of intermittent fasting. Healthy fats – Found in things like avocado, coconut oil, raw nuts, organic butter, among other sources, healthy fats can have a great benefit on your overall health. High-quality protein – Good sources of protein can be obtained from organically raised animals, or fruits and vegetables in their raw state, although the protein levels are much lower in fruit and vegetables than that of animal products. The average individual requires no more than 40-80g of protein each day. An abundance of fresh vegetables – One should aim to eat as much fresh vegetables as possible, ideally organically grown.